A paper published today in Global and Planetary Change finds global sea level rise has decelerated by 44% since 2004 to a rate equivalent to only 7 inches per century. According to the authors, global mean sea level rise from 1993-2003 was at the rate of 3.2 mm/yr, but sea level rise "started decelerating since 2004 to a rate of 1.8 ± 0.9 mm/yr in 2012." The authors also find "This deceleration is mainly due to the slowdown of ocean thermal expansion in the Pacific during last decade," which is in direct opposition to claims that the oceans "ate the global warming." This finding debunks alarmist claims that ocean heat uptake has increased over the past decade, demonstrating instead that ocean heat uptake has decreased during the global warming pause since 2004, and has gone negative since 2007, as shown by fig. 4b indicating steric sea level rise from thermal expansion has been negative since 2007. "no long-term acceleration of sea level has been identified using 20th-century data alone." "It is likely that GMSL [Global Mean Sea Level] rose between 1920 and 1950 at a rate comparable to that observed between 1993 and 2010"
The instantaneous rate of interannual variability of (a) the GMSL, (b) the global mean steric sea level, and (c) the global mean ocean mass, i.e. the first-order time derivative of third IMFs shown in Fig. 1.
a. Regression of total sea level (observed by altimeters) during 1993-2012 on the third IMF of the GMSL given in Fig. 1a. b. Same as Fig. 3a but for the steric sea level. a. The intrinsic trend of the GMSL, i.e. the first-order time-derivative of the trend function of the GMSL given in Fig. 1a. Thick solid black line denotes the mean intrinsic trend of all the sub-samples of the GMSL during 1993-2012. Thin solid black line gives the linear trend of the GMSL rise, and the thin dashed lines give its one standard deviation. b. Same as Fig. 4a but for the intrinsic trend of the global mean steric sea level. c. Same as Fig. 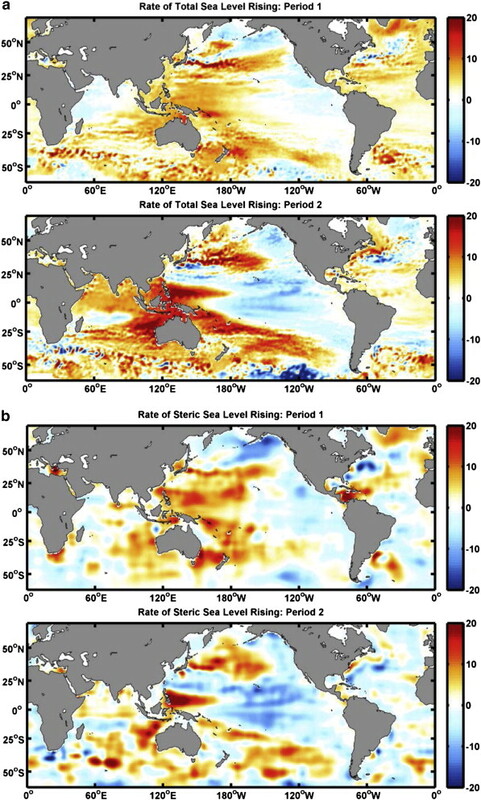 4a but for the intrinsic trend of the global mean ocean mass during 2003-2012.
a. 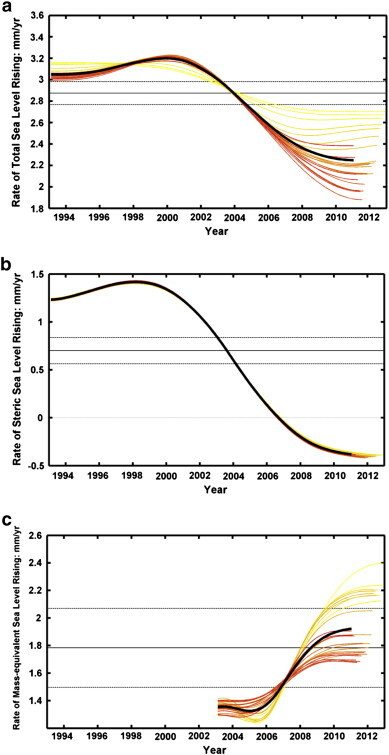 Mean trend of the total sea level rise during (top) Period 1 (1993-2003) and (bottom) Period 2 (2004-2012). b. Same as Fig. 5a but for the steric sea level. a. The global mean sea level (GMSL) with the ending date changing from 1 to 24 months earlier relative to December 2012 (bottom panel, thin lines end with the color from red to yellow). 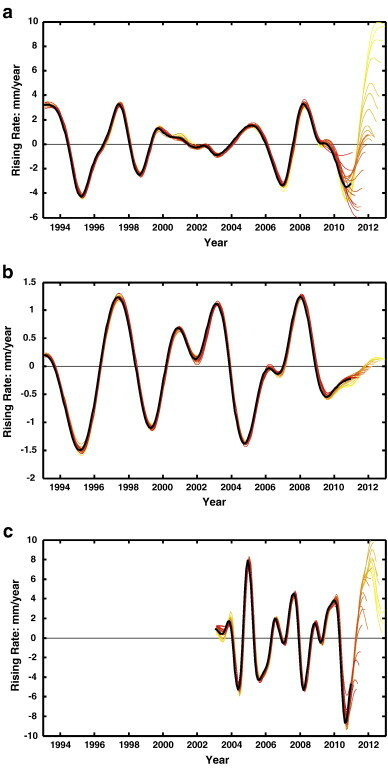 The IMFs of each time series, corresponding to the high-frequency noise, the annual cycle, the interannual variability, and the trend function (see text), are given as the colored lines in the panels from top to bottom, respectively. The ensemble mean of the IMFs on the different time scales during 1993-2010 are given as the thick black solid line in each panel. The colored bar in the third panel is the normalized Nino 3.4 index with arbitrary amplitude. The statistical confidence interval of the trend function is given by gray shadow in the bottom panel. The data is in units of cm. b. Same as Fig. 1a but for the global mean steric sea level. c. Same as Fig. 1a but for the global mean ocean mass during the period from January 2003 to December 2012. The global mean sea level started decelerated rising since 2004 with the rising rate 1.8 ± 0.9 mm/yr in 2012. Deceleration is due to slowdown of ocean thermal expansion during last decade. Recent ENSO events introduce large uncertainty of long-term trend estimation. Projection of future sea level change relies on the understanding of present sea-level trend and how it has varied in the past. Here we investigate the global-mean sea level (GMSL) change during 1993-2012 using Empirical Mode Decomposition, in an attempt to distinguish the trend over this period from the internannual variability. It is found that the GMSL [Global Mean Sea Level] rises with the rate of 3.2 ± 0.4 mm/yr during 1993-2003 and started decelerating since 2004 to a rate of 1.8 ± 0.9 mm/yr in 2012. This deceleration is mainly due to the slowdown of ocean thermal expansion in the Pacific during last decade, as a part of the Pacific decadal-scale variability, while the land-ice melting is accelerating the rise of the global ocean mass-equivalent sea level. Recent rapid recovery of the rising GMSL from its dramatic drop during the 2011 La Niña introduced a large uncertainty in the estimation of the sea level trend, but the decelerated rise of the GMSL [Global Mean Sea Level] appears to be intact. Stephan Rahmstorf’s ‘rising sea level’ papers are based on models that use output from climate models as input. It doesn’t get any more “Garbage-In, Garbage-Out” than that. And how sad is it that a climatololgist with a Ph.D apparently can’t tell or doesn’t know the difference between actual sea level rise and land subsidence? This latest paper appears to be another Rahmstorf classic: conclusions based on garbage ocean temperature data and faulty assumptions. His former professors must cringe when they read this stuff. If anyone can point me to a paper by Stephan Rahmstorf that makes sense, please do so. I no longer waste my time reading his drivel. 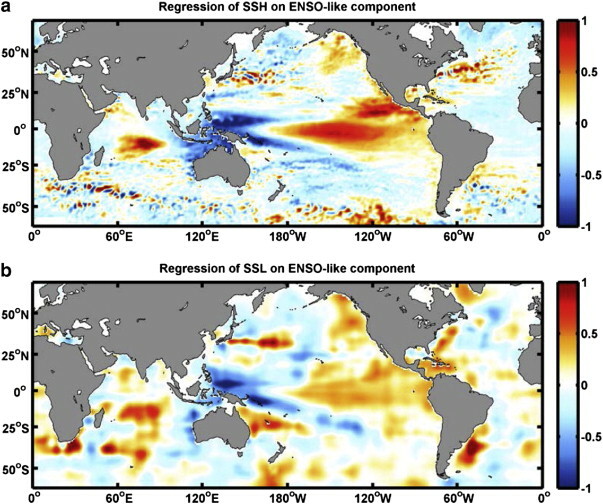 Although the Gregory et al paper was accepted in 2012, it was finally published in 2013 (see http://journals.ametsoc.org/doi/abs/10.1175/JCLI-D-12-00319.1 ). This paper is important as two of the authors are lead contributing IPCC authors for sea level chapters. The whole paper is worth reading but the abstract contains the key point - "The reconstructions account for the observation that the rate of GMSLR was not much larger during the last 50 years than during the twentieth century as a whole, despite the increasing anthropogenic forcing". So, no acceleration in sea level rise, despite all the claims by some parties. The important point is that the heat, once diffused to a lower temperature, can never result in a subsequent rise in temperature, which would be contrary to the first law. Therefore, any heat, once sequestered by the oceans, can never reverse its thermodynamic pathway, and reheat the atmosphere to the temperatures that caused it to be absorbed in the first place. The Achilles heel of climate models is over focus on CO2 and under focus on snow, ice, cloud, land, and water Albedo (reflectivity). No real problem surfaces in understanding water vapor, CO2, methane, and other GHGs ability to re-radiate heat. But add (70% reflecting) ice to the Antarctic sea-ice doughnut surrounding Antarctica, while covering (80% absorbing) ocean with the addition, and consequences are obvious. Same holds for Asian and NH snowcover. Albedo from snow, ice, cloud, etc., pierces CO2 at wavelengths it does not re-radiate. These consequences too, are obvious. The relentless but small (from a percentage standpoint), CO2 rise has been overtaken by a substantial albedo increase planet-wide, including the equatorial Pacific. I need not spell out that the temperature standstill consequences are obvious - - and have been observed!! !